Here's something interesting. 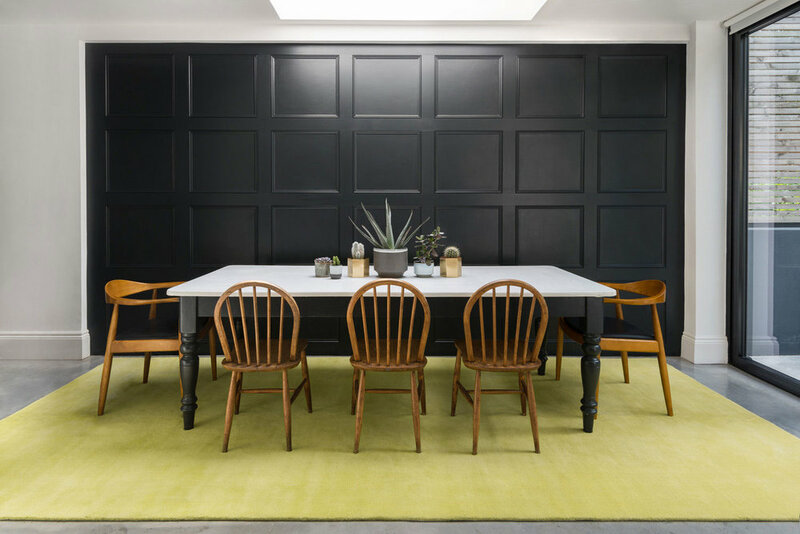 The Rug Company has recently collaborated with Farrow and Ball to produce a range of 12 individual handloom made rugs that are designed to perfectly complement the classic paint range that so many of of us know and love. The Complementary Colour Collection is one of those really good ideas which seems so obvious once you are presented with it. 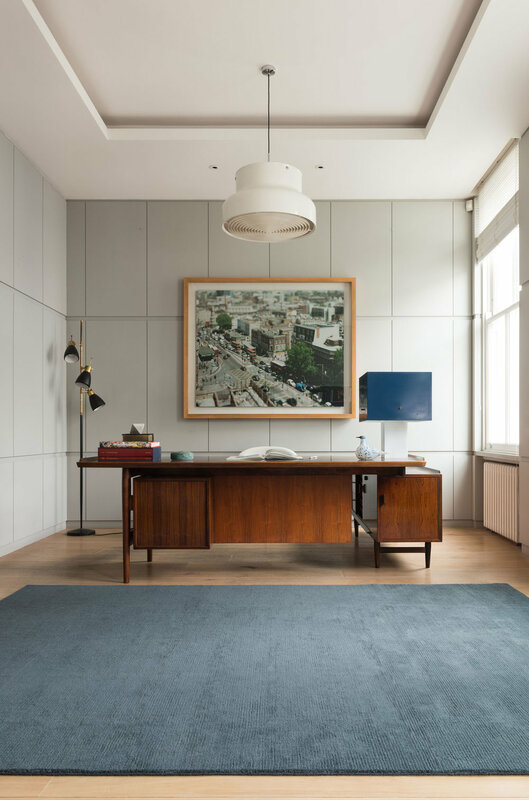 Simple and understated, the rugs are perfect for adding some subtle colour and texture to your floors to work alongside your Farrow & Ball walls. 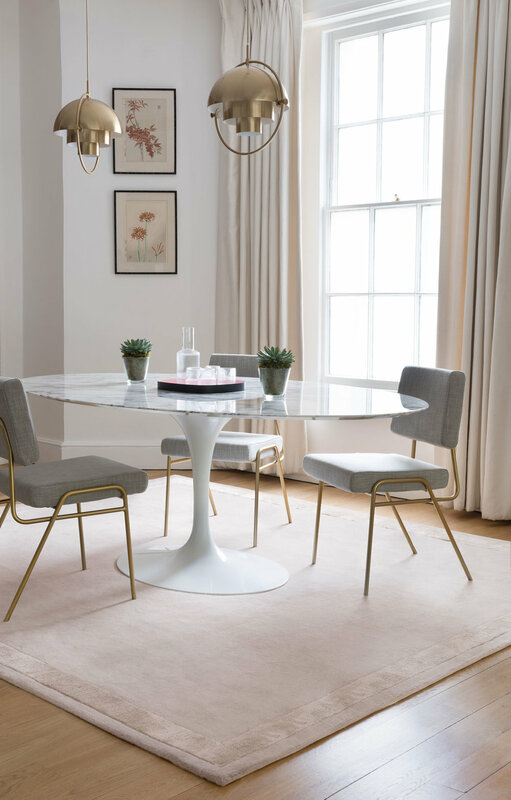 The Rug Company have catered for a wide range of different interior styles with this collection - there's something to suit everyone's taste, from the traditional to the more contemporary. If like us you're drawn to more modern minimal interiors, then incorporating subtle textures and details will help ensure your home feels soft and inviting. 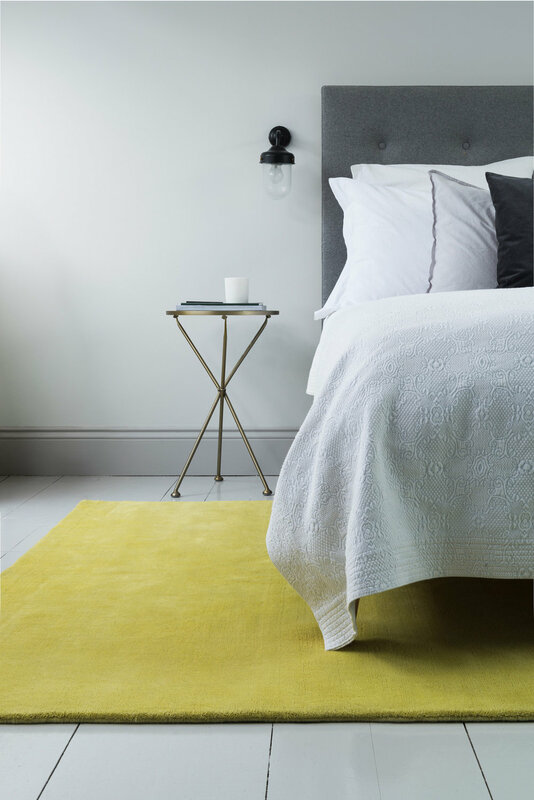 Keeping the balance just right is key to maintaining a sense of peace and calm, and one of these new rugs could be just the thing to add that extra touch of warmth over the coming winter months, without visually overloading your living space. Personally, I love the idea of using a rug with subtle tones to add a 'colour wash' to the floor in much the same way as paint does to a wall. It will instantly add interest to a space and can also be used to define different zones within an open plan living area or to draw a focus towards particular piece of furniture. A rug is much more pleasurable to walk on than bare floorboards during the colder winter months, and in my experience pets will love you all the more for providing that extra layer of comfort too. The new rug collection is available in 3 different textures - plain wool, cut and loop stripe and wool with a silk border. The range offers 6 colour accents and 6 neutrals to go with Farrow and Ball's well known neutral paint groups. Some of the architectural, contemporary, traditional and easy neutrals are featured below but the collection also includes red and yellow based neutrals. Easy neutrals include Order Grey, a smart and even grey that's incredibly easy to live with and Melrose Yellow, a vibrant optimistic colour that evokes the sunny climes of Los Angeles. These are designed to work with Farrrow and Ball's Purbeck Stone, Ammonite, Wevet and Comfort White. Match Holland Stone (a warm and sophisticated neutral inspired by Georgian townhouses) or Lots Blue (a soothing tone evoking the sea and sky) with Farrrow and Ball's Lime White, Off-White, Old White and Slipper Stain paint finishes. Pair either Sam's Stone (a clean natural tone that adds a contemporary twist to each room of the home) or Portland Pink (a restful pink with a subtle blush tone that effortlessly adds colour without stealing the show) with Farrrow and Ball's All White, Strong White, Skimming Stone or Elephant's Breath. Pair either Wizlet, a cool and light grey which is perfect for creating a thoroughly modern feel, or Wooster (inspired by the ironwork facades of Wooster Street in New York) with Farrrow and Ball's Dimpse, Pavillion Grey, Blackened or Manor House Gray. So, you simply pick the colour, size and texture option that best complements your room and colour scheme. I say 'simply', but as we all know choosing from a Farrow and Ball paint swatch card can be quite a time consuming process in itself. In my experience it usually involves several cups of tea, some cake and perhaps even enlisting the opinion of a friend before you finally settle on 'the one'. Of course this is all part of the joy of making a house a home, but knowing that The Rug Company have already done a lot of the hard work to match the colours for you makes deciding just that little bit easier. Posted in collaboration with The Rug Company. Images courtesy of The Rug Company.